Agdia's IYSV ImmunoStrip® offers rapid and on-site detection of Iris yellow spot virus, an economically important pathogen to several species of the Allium genus including onion, garlic, leek, shallot and chive. IYSV is spread by thrips making it very important to remove sources of inoculum as quickly as possible. 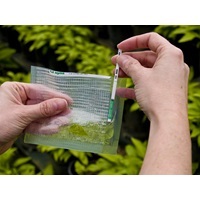 IYSV infection can result in a reduction of bulb size, seed yield and seed germination rates. Managing plant disease is critical to keeping crops healthy and profitable. Agdia ImmunoStrips® make disease management easier by allowing users to test right in the field without the need for equipment or expertise. ImmunoStrips® are simple to run and provide results in as little as 5 to 10 minutes. IYSV ImmunoStrips® are ideal for use by anyone who wants to obtain results quickly and have greater confidence when making management decisions, including crop consultants, growers and field inspectors.